Maybe I got a little carried away with this one. You be the judge. 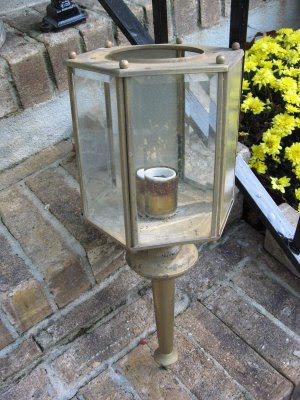 I recently replaced the old lanterns in front of my house. I was just about to throw it away when I realized I may actually be able to make something out of them. Here is what it looked like before. Pretty ugly, don't you agree? Here is what I did with it. I took out all the surrounding the glass and replaced it with wood, cutting a hole out for the birds and installing a perch. I removed the socket and built a little floor. I caulked all the seams (don't want it raining down on my feathered friends) and sprayed the brass, white. The wood was painted gray. It now matches my house. I'll be picking a tree tomorrow and hanging it up. So now, the old fixture won't rot out in some landfill, but will hopefully become a home for some birds in the spring. Hey, I'm saving the world in very little ways. A-mazing! I wish I had 1/10 of your creativity. I am inspired! Thanks Christy. You are nuts! But that's why they squirrels will like your bird house too! This is so great. I have a light on a pole and think I'll try this in the Spring. Wonder what to do with the pole? Hey Carol. Why not leave it on the pole and stick it right into the ground. Then you won't have to even find a tree to hang it from, right? I have truly been amazed at the creativity that God's blessed you with! I've recently gotten into thrift store shopping and looking for great deals. 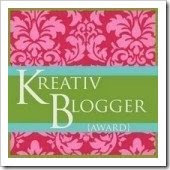 Your site has helped stir up my creativity! Thanks! Ooooohhhh...I love it. That is pretty darn creative. Absolutely fabulous. Very clever. I'm sure some bird family will be very happy. That looks fabulous! You are so creative. 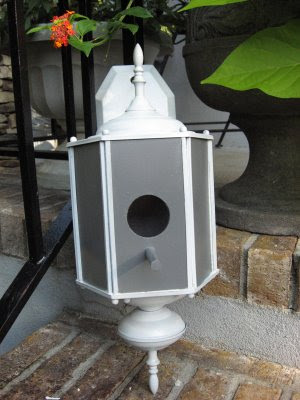 I'm sure that any bird who appreciates colonel style architecture is going to move into your bird house over some gourd with a hole in it. What a great save! I think it really looks awesome. :) Clever! That is great. Good job at using her noodle.